SST contacted Wastecorp Pumps to receive proposals for a dust control system at its Dickinson, North Dakota freight terminal operations. SST specifications called for two high capacity water trailers with the ability to fill the tank from a fire hydrant. With any high use equipment in an industrial environment, components must be able to withstand punishing conditions. That’s why we built SST’s water trailers with triple axles to safely haul up to 1635 gallons each. The elliptical leg tanks were secured with steel bands for the ultimate in load stability. We also included a valve control system for both suction and discharge. This means that the pump can be used to both fill or discharge the tank; a real productivity enhancer. We also included a custom fire hose nozzle for quick tank filling from any municipal fire hydrant. Of course the custom rear sprayers were designed for just the right amount of water coverage for various dust control applications. Wastecorp Pumps is an ISO 9001 certified pump manufacturing company specifically focused on designing and manufacturing municipal and industrial pump systems. Wastecorp’s advantage is making custom modifications to pump designs to suit the end user’s needs. 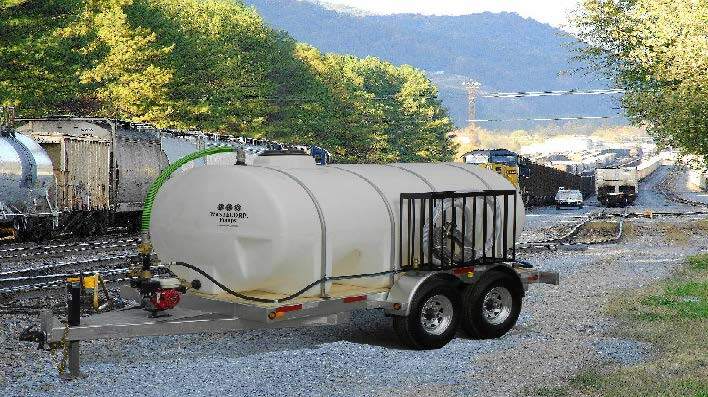 The best part is, we do so cost effectively and with some of the quickest water trailer delivery times in the business. The United States and Canada have redefined the energy market in recent years. Energy companies and those who transport fuels are investing more in pumping equipment to enhance the productivity of their operations.